Wow that ingame screenshot looks awesome! Good job! 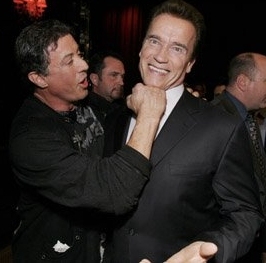 Got a license to use the gotesk of Arnold Schwarzenegger and Sylvester Stallone? You also added layers (look the players in the back! Aren’t that more then 3 layers?). But where are the weapons? You still need to them! ROFLMAO 😀 That definitely is the face of a terminator when he gets runtime error. Most epic picture ever seen!